Jess Loren, creator of the Chicago Christmas Crawl, answered questions from Wicker Park residents about her upcoming event. WICKER PARK — Though members of a Wicker Park community group voted 11-7 in favor of a Christmas-themed pub crawl, a local alderman said he wants two other neighborhood groups to weigh in on the event before it can head to Division Street in December. At the Wicker Park Committee's monthly meeting Wednesday, Jess Loren, organizer of the Chicago Christmas Crawl, said that while no permit is required to produce a pub crawl, she is applying for one from the city anyway to help alleviate community concerns. The crawl's special-event permit would require the approval of Ald. Joe Moreno (1st). Scheduled for 10 a.m.-8 p.m. Dec. 13, the Chicago Christmas Crawl would take revelers to participating bars along Division Street between Ashland and Hoyne avenues. For a $35 ticket, attendees would receive a Santa hat, a turkey baster, a souvenir badge and a lanyard necklace. Bars and restaurants taking part in the crawl would offer drink specials. And for an extra few dollars, bar crawlers can buy tasting portions from menus. Loren, who formerly worked with the same crew that put together the Twelve Bars of Xmas crawl, or TBOX, in Wrigleyville, has drawn controversy for her plan to bring a pub crawl to Division Street. Loren said she sold her previous company, Kambio Group, which did marketing for TBOX's parent company, Festa Parties, to another company and is not involved in TBOX. Since the Chicago Christmas Crawl event is in its first year, Loren said she does not have an estimated numbers of attendees but expects the crawl to bring in a few hundred people. David Coleman, head of security for the crawl, told Wicker Park residents that the crawl "has no heartbeat yet." Coleman, whose firm does security for The Boundary at 1932 W. Division St, which is one of five bars signed up to participate in the crawl so far, said the event is hoping to attract a "30-and-up crowd." 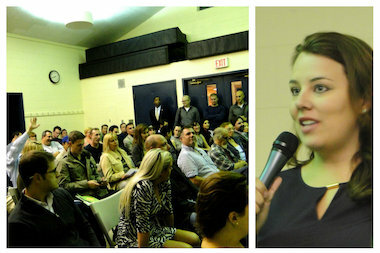 After the meeting, Leah Root, president of the Wicker Park Committee, said hearing directly from Loren "was helpful." "I am impressed that she came and stayed for the whole meeting and took it very seriously. If the crawl is as presented, it could be a good event," Root said. Moreno said he was still not sure if he would support the crawl. "It sounds OK on paper, that it's not going to be a Wrigleyville beer-slamming event. Wicker Park would not want that kind of event," Moreno said. "If they stick to their presentation, it sounds better than we thought." Moreno said he wants to see how the members of two other community groups, the East Village Association and the Ukrainian Village Neighborhood Association, feel about the crawl before he makes a decision on whether to sign off on the permit for the event. On Thursday, Loren said she was unaware that she needed to meet with other neighborhood groups beyond two local chambers and the Wicker Park Committee. Loren said that while she is open to meeting with other groups, she planned to submit her special-event permit application by the end of the week. "Our focus the past few weeks was on working with the community to secure a comfort level to proceed with our plans," Loren said. Emily Wood, general manager of The Boundary, was not at the meeting but said afterward she feels confident the crawl would "attract a more mature audience" and that Loren would "keep the numbers [of revelers] low." "No one on Division Street wants another TBOX event, but if you want to bring adults and a more mature crowd together, that's great. Wicker Park is not Wrigleyville. We've got a lot of families here," Wood said. Loren said ticket sales so far have been "very minimal" and she has not decided on whether to cap the total number of tickets she would sell. "We will look to see how many venues we have signed on at the time of the event and go from there," she said.